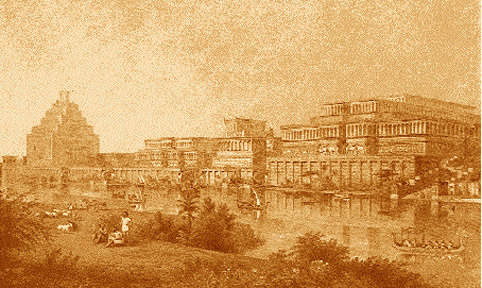 I have resisted until now writing much about Iraq, as so many others are doing a superb job. (See the bloggers listed here.) What is the need for yet another pen? And yet...and yet...remaining mute has become frustrating. Yesterday I had a chat with an acquaintance. He was against the war---no surprise there. His reasoning was as follows: Bush is acting against the wishes of the entire world; Bush is stupid; the American people have been fooled into supporting the war by Bush and his political-military buddies; Bush is stupid; it's all about oil; Bush is stupid; there must be something other than war to solve the Iraqi problem; Bush is stupid. And so on. His comments were revealing about the liberal mindset and what passes for debate and analysis there. I told him that more than 40 nations are supporting the US. He said that most of these were "little bitty places." Well, yes---and never mind "little bitty" England and Australia---rather like Czechoslovakia in 1938. Neville Chamberlain said of that hapless nation that "it is a far-away land filled with people about whom we know nothing." And we know what happened to the Czechs. Should not "little bitty places" also have a say in decisions concerning war and freedom? If so many Americans are being fooled by Bush, well what does that say about the stupidity of Mr. Bush? He must be a clever sort to delude his subjects so completely. Stupid, Bush became governor of Texas; stupid, he defeated his rival for the presidency even in a time of (relative) peace and prosperity; stupid, he directed the conquest of Afghanistan in 9 weeks, something Soviets could not do in ten years though they shared a border with that nation; stupid, he is directing the most awesome display of military lethality the world has yet seen. And so on. If the US is acting "against the wishes of the entire world," well what of it? Is truth decided by a show of hands? Does my friend take a vote before doing the right thing? Bush has taken an oath to defend the US Constitution and the American people, not to accede to the demands of France and China. If those nations do not like what the US is doing, well that is just too damn bad. Do these states refer to the UN when they act upon the world stage? Does France go to the Security Council before deciding to send troops to her African dependencies? Does China look for a vote among nations before threatening the US or Taiwan? And what would my friend do about Iraq, one of the most mind-boggling Orwellian tyrannies in the world, a nation that has slaughtered more Moslems than any state in history and one that continues to slaughter them? He did not say---he seemed quite ignorant of the history of Iraq in any case---except that surely something could be done other than war. And so on. Behind his every argument was the hatred he felt for Bush and "his war." He had not one word about the suffering of the Iraqi people. He did not (or could not) critically examine the administration's reasons for waging war. He did not question her own reasons for opposing it. No analysis, no thought, no search for truth, just "stupid Bush" and the idiots who supported the war. I was not surprised at all when he said he wished that Al Gore had won the presidency. I imagine that Saddam Hussein agrees with him. 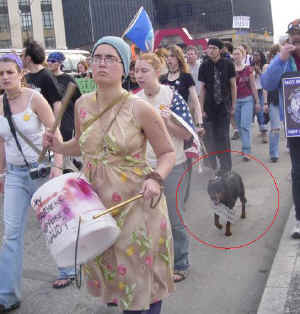 All of my friend's outrage was directed toward Bush, none at all toward Hussein---rather like the so-called anti-war protestors, among whose millions not a single Iraqi was to be found. In the meantime in far away little bitty Iraq, its people are rising up against the hated Hussein and welcoming the American and allied forces that are liberating them. Who helps them? Not the UN, that impotent club of tyrants that passed resolution after resolution (18 since 1991) demanding that Iraq disarm---all to no effect; not France, who has sold Iraq a nuclear reactor and who has supplied Hussein the arms he uses to murder his own; and not Germany or Belgium or Canada. It is Mr. Bush, poor stupid Mr. Bush and his deluded subjects. But the Iraqi people are not deluded. They understand in ways impossible to those who have never suffered in their lives, who have never lived under tyranny, who have never feared the knock at the door at night. 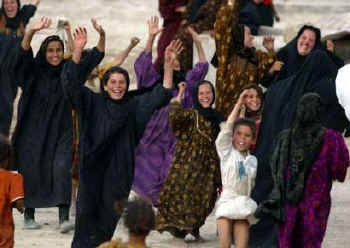 They know this is not about oil, it is about them. They know that their liberty is being purchased by allied blood and not by drum-beating war protestors who bleat "No war for oil! 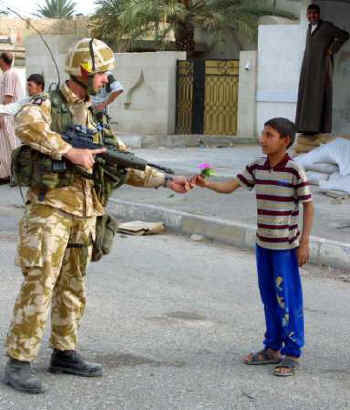 No war in Iraq! Bush is Hitler!" Stupid Mr. Bush knows this too. Whom do you want defending your nation and its freedoms? The French are at it again. Prime Minister Jean-Pierre Raffarin said on April 3 that "The Americans made a triple mistake: first of all a moral mistake, and I think we have to say this: there was an alternative to war. We could have disarmed Iraq differently...Also, (they made) a political mistake, because we know very well the difficulties of this region of the world...It's a serious political error to start trouble in this region...And then, there is a strategic mistake: that today one country can lead the world." So France sees an American "moral mistake." Interesting that a nation that in 1940 gleefully turned over 62,000 of its Jewish citizens to the Nazi death camps should be speaking about a "moral mistake." Interesting that a nation that sold a nuclear reactor to Iraq should be speaking about a "moral mistake." Interesting that a nation most of whose citizenry wishes for an Iraqi victory should speak about a "moral mistake." Interesting that a nation in whose soil lie the bones of 50,000 Americans who died for French liberty should be speaking about a "moral mistake." But the Prime Minister is correct about one thing: "...there was an alternative to war." Yes: surrender, a habit at which France is a practiced master. And a "political mistake"? Mr. Prime Minister, how is waging war upon a monster who rapes and murders and gasses and tortures his own citizens a "political mistake"? We Americans understand well the politically courageous French who resisted Hitler for a whole five and a half weeks before turning over their entire nation to the whims of Nazism and then collaborated with their conquerors. We Americans understand well the tyranny and corruption that your nation spread throughout her colonies in Africa and Asia. We Americans understand well the hatred France feels toward the nation of Israel, and of her own history of anti-Semitism. And please tell me, Mr. Prime Minister, how France would have gone about disarming Iraq? She cannot even disarm the Ivory Coast. All nations whom France has fought---Mexico, Germany, Algeria, Russia, Spain, Egypt, Vietnam, Britain---have beaten her. The history of France is one of defeat and silly posturing. And a "strategic mistake," Mr. Prime Minister? The US has neither the intent nor desire to run the world---though she certainly could do so if she wished. (France certainly would not put up much of a struggle.) Americans conquer world-class dictatorships, force them into democracy and freedom, and then go home. We have never collaborated with our conquerors for we have never been conquered. The US freed Europe from its two civil wars, liberated France and Germany and Italy and Japan and Belgium and Holland, defeated the USSR in the Cold War and thereby brought freedom to all of Eastern Europe---the same Eastern Europe that your President Chirac publicly and crudely insulted for siding with the US---and is now bringing freedom to Moslems in Iraq as she has in Bosnia and Somalia and Kosovo and Kuwait. Where has France been throughout all of these historic struggles? Is there any nation to whom she has brought liberty? Most of your ex-colonies---Haiti, Algeria, Cambodia, Vietnam, Syria, Lebanon, and wherever you planted your flag in Africa---are cesspools of violence, poverty and despair. Mr. Prime Minister, your prancing about on the world stage would embarrass you, had you any shame. Your nation feeds off the faded glories of Louis XIV and Napoleon---and he was Italian. She has not the power or influence or moral backbone to do anything but prattle and deceive. France is like an aging prostitute who puts on yet another coat of makeup and prowls the streets of the world in a attempt to attract a suitor, any suitor. Even Saddam Hussein will do, and he pays well. So Mr. Prime Minister, please shut up. You and your nation have been on the wrong side of freedom since 1789. You have no right to lecture anyone on anything except cheese, cowardice, corruption, collaboration and surrender. Stick with what you know. 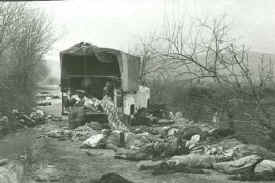 It was Patton and the Third Army that first reached Buchenwald in 1945. The scenes were overpowering even to him. After viewing a room of humans who had been starved to death, Patton vomited. What he saw was the real Nazi Germany. We are seeing the same thing now in Iraq, the real Iraq as it exists outside the fantasies of the UN and the anti-war crowd. Torture chambers have been discovered in Basra and at the international airport outside of Baghdad. The scenes are as grisly as anything found in Germany, and more will surely turn up. 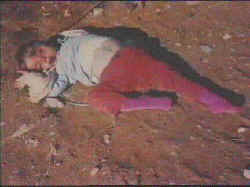 Hussein, like Hitler, had photos taken of his victims. Gunshots to the head, sacks of bones, mutilated faces, corpses displayed on meat hooks, electrocution rooms, castrations, forced amputations and cannibalism---the catalogue of horrors that the Iraqi people have been living in is something unfathomable to us. This is why what remains of the Republican Guard in Basra has offered to surrender as long as the British will protect them from the citizens of Basra. 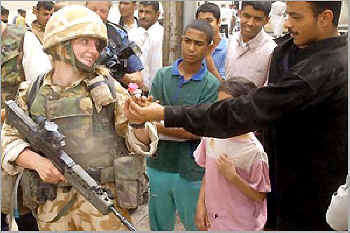 Guard commanders in and around Baghdad are now negotiating with American forces for similar treatment. 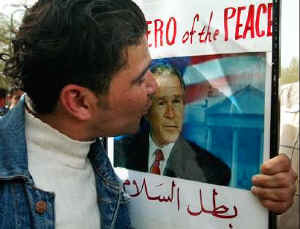 The Iraqis know well who their torturers and killers are. Like the helots of Sparta who dreamed of "eating the Spartans raw," the helots of Iraq, if they get a chance, will tear the Baathist regime apart limb by bloody limb. This is why the US military sent an armored column deep into the heart of Baghdad yesterday---to encourage the civilians and bring fear to the regime. The BBC called it "the biggest drive-by shooting in history." Well, OK, but its point was to show the Iraqi people that the regime is no longer to be feared, that the Americans can go wherever they please into the heart of Baathist territory and the regime can do nothing to stop them. Clearly this regime is in its death-throws: still dangerous, still able to kill, but soon to expire. 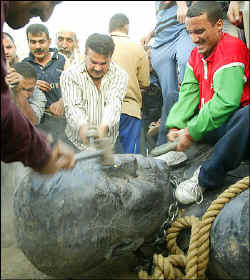 The Iraqi jackboot "forever stomping on a human face" will be removed. No word yet what the peace protestors think about this. 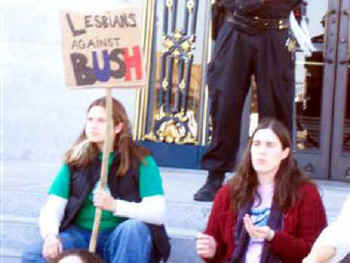 What will they do with all of those "Bush is Hitler" signs? Hussein will soon be gone. But the war will not be over. Every evil practiced by the Iraqi Baathists has been practiced by their brothers who rule Syria. Both this nation and Iran have vowed to send assistance to Hussein (though it had better arrive quickly); both are masters at the craft of terror; both kill and imprison those who resist their tyrannies; both sponsor murder and tyranny beyond their borders. And so, a prediction: Syria is next, and then Iran. Mr. Bush has said as much. Mr. Rumsfeld has said as much. 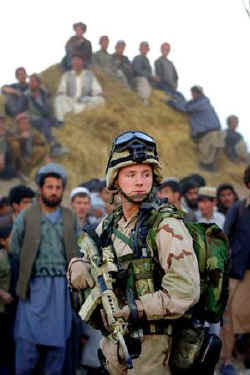 The American people support a widening of the war. The US military in the region is preparing for a much greater war. 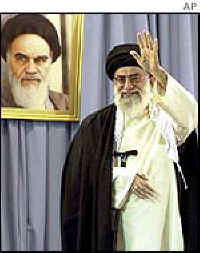 The regime of Assad and the mullahs who rule Iran will be visited soon. Cry havoc, for the dogs of war have slipped their tether. Like Yamamoto in 1941, Osama bin-Laden unleashed forces incomprehensible to him and his like. 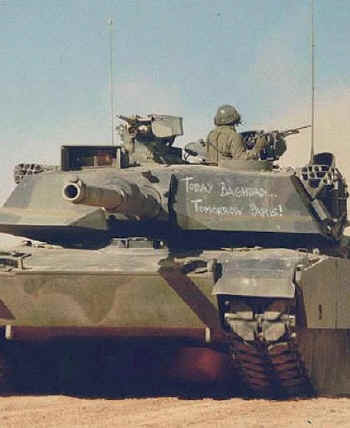 The American people are ferocious when aroused---ask Japan and Germany and al-Qaeda and the Taliban---and will send their armies to Hell and beyond to annihilate their foes who would murder them in their beds. Those map makers who specialize in the Middle East will soon have much work to do. Oh, I should add that the pot-bellied murderer who rules North Korea has not been seen recently. Rumor has it that he is holed-up somewhere in Pyongyang watching CNN and the progress of allied arms. I doubt he is sleeping very well. It was Russia, France and China who opposed any US military action against Iraq. Their reasons were entirely moral and humanitarian. Here is more proof that the Iraqi military received training from France. 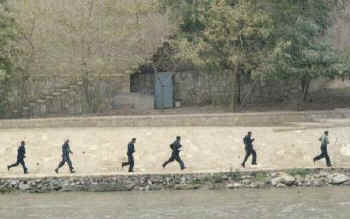 These soldiers are fleeing from US forces as fast as they can along the Tigris. Their rifles have been thrown away. The photo is dated April 7. The body of Ali Hassan al-Majid ("Chemical Ali") was found dead this morning in Basra. 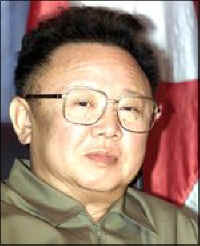 In a regime noted for mind-boggling cruelty, he was the cruelest of all. He gassed thousands of Kurds, personally executed prisoners, and loved being photographed kicking the corpses of his dead enemies. He has been no less homicidal to members of his own family. 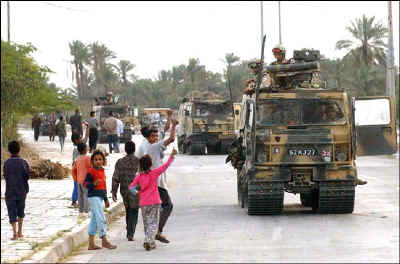 US forces now wander freely through Baghdad killing all who oppose them, taunting their enemies and showing the Iraqi civilians that their long nightmare is coming to an end. I recall similar marches: Epaminondas' descent into the Peloponnese, Sherman's March to the Sea, Patton's Third Army racing into the heart of Nazism. All of these spelled the end of the regimes against whom they were aimed and freed those imprisoned by their tyrannies. The end game is here. The Iraqi 'Republic of Fear' will be no more. 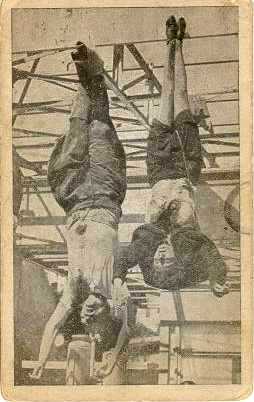 Mussolini and his mistress in 1945. 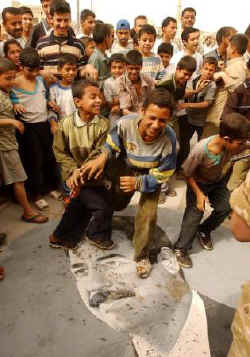 Hussein will soon join them. 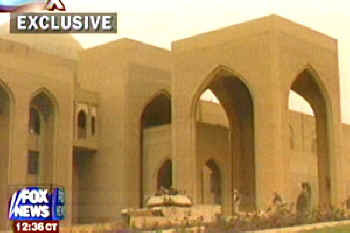 One of Saddam's 14 palaces. Here is what happens when a newly liberated people finally get a chance to avenge themselves upon those who have raped, robbed, murdered, tortured and imprisoned them for decades. 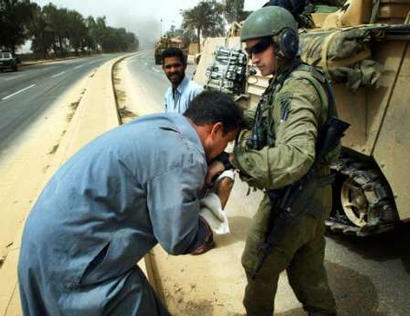 The man being beaten is a Fedayeen, one of Hussein's so-called special troops. 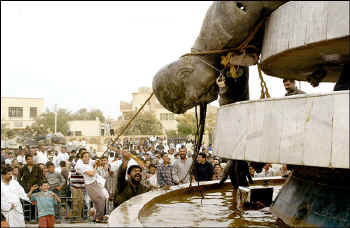 This happened in Basra, and this scene is being repeated all over Iraq. May God have mercy on this man, for the Iraqi people will not. 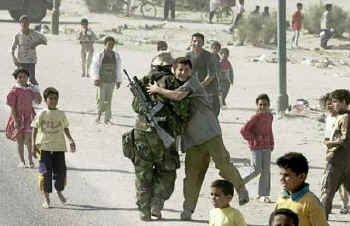 The US Marines yesterday freed 150 children who had been prisoners. Many had been held for five years. 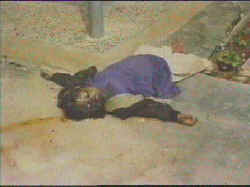 Their crime was refusing to serve in Saddam's Baath Party Youth Brigades. No word yet what the 'Bush is Hitler' crowd thinks of all this. smashing the face of another. To all those who opposed this war: Saddam agrees with you. To all those who said the war was about oil: Saddam agrees with you. To all those who called the Americans imperialists: Saddam agrees with you. To all those who wanted the UN to have more time for inspections: Saddam agrees with you. To all those who hate Bush: Saddam agrees with you. To all those who call the US a terrorist state: Saddam agrees with you. To all those who plan on disrupting the US-led war through protests: Saddam agrees with you. To all those who hate the US: Saddam agrees with you. To all those who love the UN: Saddam agrees with you. To all those who call Bush another Hitler: Saddam agrees with you. To all those who thought the US would have no allies: Saddam agrees with you. To all those who called Tony Blair a poodle of Bush: Saddam agrees with you. To all those who think that Iraqis cannot handle democracy: Saddam agrees with you. To all those who supported France in the pre-war diplomacy: Saddam agrees with you. To all those who said that Iraq could not be defeated: Saddam agrees with you. To all those who said that the Americans would get bogged down in an unwinnable quagmire: Saddam agrees with you. To all those who call the Americans and their allies war mongers: Saddam agrees with you. To all those who said that the US could not win any urban conflict for Baghdad: Saddam agrees with you. To all those who said that the Iraqi people would rise against the foreign invaders: Saddam agrees with you. To all those who said that Saddam does not have weapons of mass destruction: Saddam agrees with you. 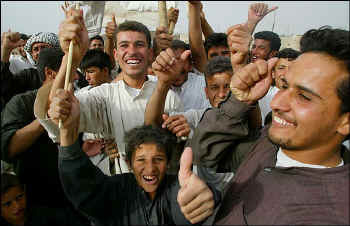 To all those who said the US could not invade Iraq because it has weapons of mass destruction: Saddam agrees with you. To all those who hate Israel: Saddam agrees with you. To all those who call this war illegal and immoral: Saddam agrees with you. To all those who said that suicide killers could defeat the US military: Saddam agrees with you. 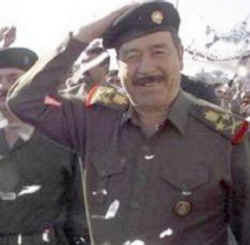 To all those who said that Iraq was no better or worse than any other Arab state: Saddam agrees with you. 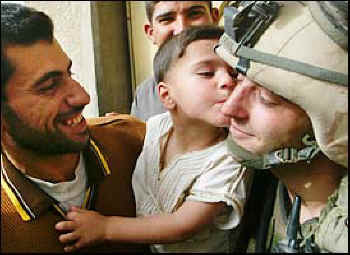 To all those who think this war was caused by the Jews: Saddam agrees with you. To all those who promised thousands of body bags for dead American soldiers: Saddam agrees with you. To all those who claimed that the US military would slaughter civilians: Saddam agrees with you. To all those who claimed that Saddam is admired by his people and all Arabs: Saddam agrees with you. To all those who pray for a US defeat: Saddam agrees with you. To all those who said Bush was stupid: Saddam agrees with you. To all those who said that the US would not fight: Saddam agrees with you. To all those who believed that Bush would respond as Clinton did: Saddam agrees with you. To all those who said Saddam loves his people: Saddam agrees with you. 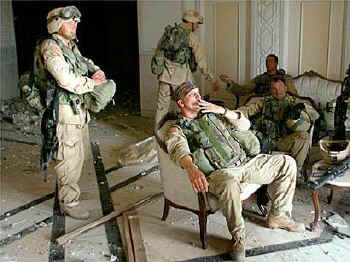 To all those who said the battle for Baghdad would resemble Black Hawk Down: Saddam agrees with you. To all those who wished Al Gore had won the presidency: Saddam agrees with you. To all of the above: Nice company you keep. 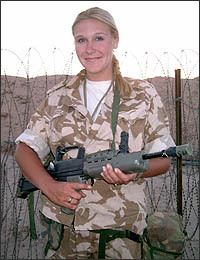 Iraqis know who brought them freedom. "From their hostile mouths I have cut their tongues. I cut off the hands of those I capture alive. 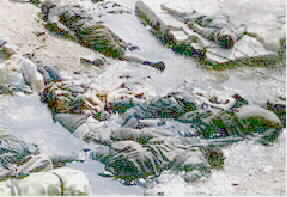 There is not one outrage done by these long-dead kings that has not had its echo in the regime of Saddam Hussein. Who mourns him now? Yesterday a veritable Nebuchadnezzar reincarnated, promising fire and death to all who would oppose him; today nothing but a downed statue covered in spittle. Your people are scattered on the mountains with no one to gather them. Nothing can heal your wound; your injury is fatal. for who has not felt your endless cruelty?